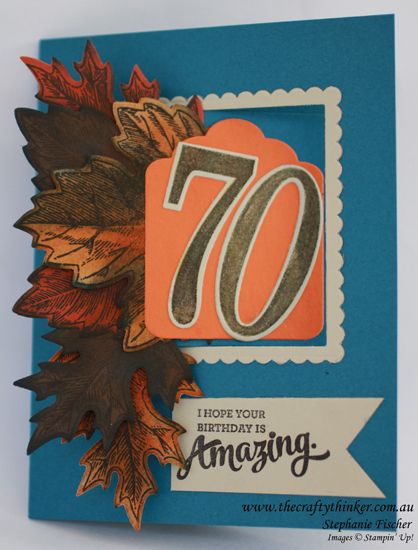 We had the pleasure, today, of attending the 70th birthday party of a dear friend and this is the card I made for him. 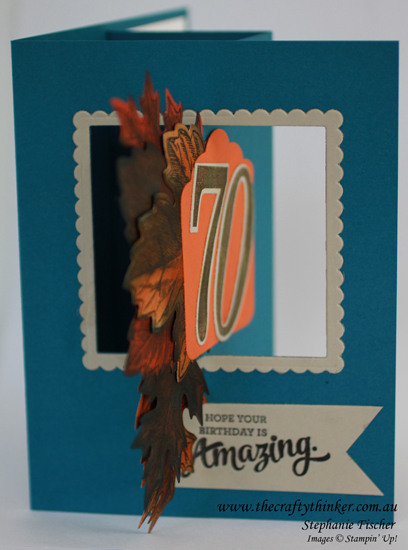 It's a half swing card which I've decorated with Vintage Leaves. I have also made a video tutorial for this card. I've taken photos from a variety of angles in attempt to record the three dimensional nature of the card. This is the front of the card and how it looks when it's closed. 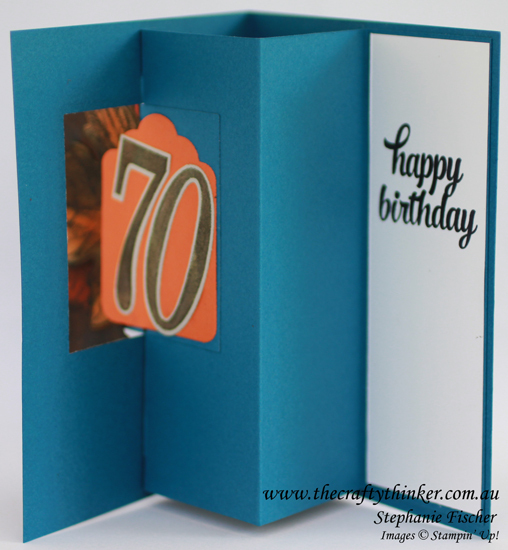 The card is made from cardstock in one of the new In Colours - Dapper Denim (141434). I'm completely besotted with this colour! I die cut the centre of card and also made the frame using the new Layering Squares Framelits (141708) that will be released with the new Annual Catalogue on 1 June 2016. The numbers are stamped (using the Number of Years set) in Early Espresso ink onto Sahara Sand cardstock and then I applied a coat of gold Wink of Stella. I die cut the numbers with the matching Large Numbers Framelits. I stamped a variety of the leaves from Vintage Leaves in Basic Black ink to the following cardstock: Sahara Sand, Cajun Craze and Early Espresso. The leaves are randomly sponged with Dapper Denim, Early Espresso, Pumpkin Pie and Cajun Craze ink. I glued the leaves in place, being careful not to foul the opening mechanism, before adding the number-bearing tag. The greeting is a sneak peek of one the greetings included with the new stamp set Mixed Borders (141932) that's in the new Annual Catalogue. I stamped it in Basic Black onto Sahara Sand cardstock and then hand cut it into a banner. (1 7/8" x 5 1/8") and stamped it with a birthday greeting from the Tin of Cards stamp set. 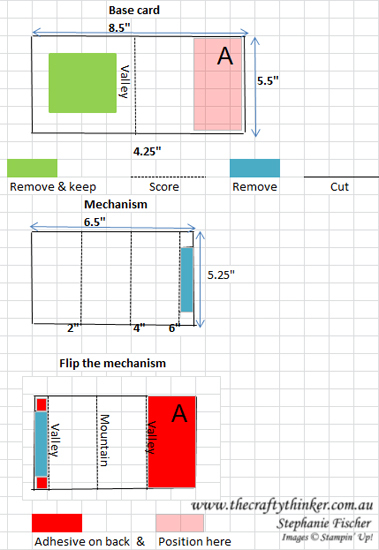 I've included a diagram, dimensions and instructions below and there is also an accompanying video tutorial. With a half swing card, the front panel of the card is still visible when the card is open! 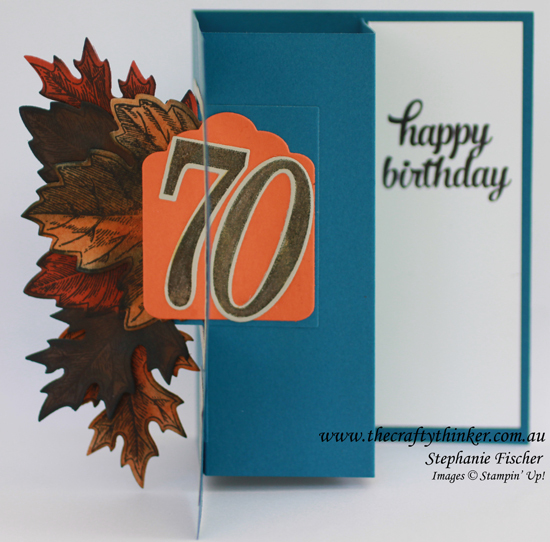 The Vintage Leaves are overlapped and adhered to the centre square panel of the card. Cut Piece 1 to 8.5" x 5.5". Score and fold at 4.25"
Use a die to remove a piece from the centre of the front of the card. Keep the die cut. Cut Piece 2 to 6.5" x 5.25". 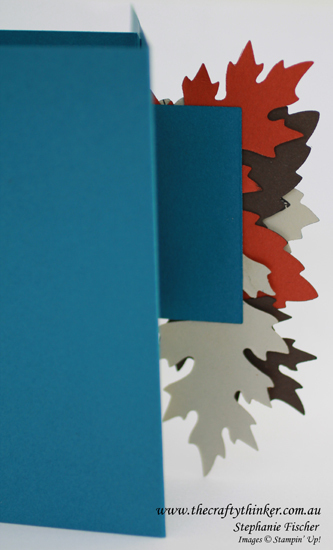 Score at 2", 4" and 6"
On side with the 1/4" fold - cut from the edge as far as the score line 1/4" from each side of the card and then cut along the score line between these two cuts to remove the centre centre. This will leave two small flaps. Fan fold Piece 2 on the score lines and place adhesive on the back of part A.
Adhere part A to the edge of Pieced 1, as shown. Place adhesive on the flaps and close the card to adhere the flaps to the inside of the front of the card. With the card closed, place adhesive on the bit of Piece 2 that is showing through the aperture. Place the die cut back into place to adhere it to Piece 2. Thank you for your visit. Do have a look at the accompanying video tutorial.